Colorado, Wyoming, and Utah are the only three U.S. states that have only lines of latitude and longitude for boundaries and that have no natural borders. You should not leave any food in your car except for in the winter, because a bear could break into your car. Colorado Springs is the home of the US Air Force Military Academy. Colorado has more than 22 million acres of park land, monuments, wildlife refuges, forests and recreational areas to explore. Colorado was named after the Colorado river that was discovered first by early Spanish explorers and originally was named “Rio Colorado” due to the red colored silt which the river washed away from the mountains. 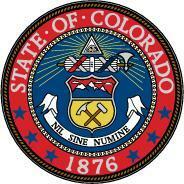 Colorado was admitted as the 38th state on August 1st, 1876 by president Ulysses S. Grant and subsequently was nicknames the “Centennial State”. The state is home to a large portion of the southern Rocky Mountains in addition to the northeastern region of the Colorado Plateau and the western side of the Great Plains. The state is recognized as the 8th ranked most extensive state and the 22nd ranked most populated state in the United States. 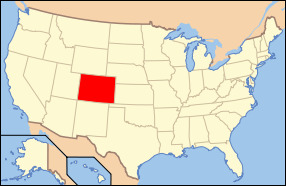 Colorado is bordered by Wyoming on its north side, Nebraska and Kansas to the east and northeast, New Mexico on its south end along with a small region of Oklahoma, and finally Utah on its west side. The famous “four corners” point is where Colorado, New Mexico, Arizona, and Utah all meet at a single point. The state of Colorado is actually just one of three states in the country that contains to natural borders around any of its perimeter. The state is widely praised for its beautiful landscape consisting of breath taking mountains, forests, high plains, canyons, desert lands, rivers, and mesas. The state capital is Denver which is also the most populated city in the state. Colorado's state bird is recognized as the Lark Bunting, and the state flower is known to be the Rocky Mountain Columbine. The state tree is the Blue Spruce while the state song is “Where the Columbines Grow”. The states highest point of elevation is Mt. Elbert where it reaches a peak of 14,433 feet. The lowest point is the Arikaree River which is 3315 feet above sea level. Presently the states economy revolves widely around agriculture, specifically cattle, dairy products, corn, hay, and wheat. The main industries in the state are food processing, transportation equipment, machinery, scientific instrumentation, chemical products, mining, and tourism. Overall Colorado is more than just a square on the map of the United States, it is filled with beautiful scenery and seemingly endless plains. The city life is also something to behold as Denver is thriving with opportunity and entertainment. It is without a doubt one of the most vast and eye pleasing states in the country and will continue to draw the attention of site seer's and tourists alike.